Gingerbread houses are one of those Christmas traditions I've never embarked on. Largely cause I seldom like the taste of gingerbread. That's what happens when you're solely exposed to the store-bought variety: it's just never a true representation of what the fresh baked stuff tastes like. So I decided it was high time I gave it a go. I'd wanted to try something more elaborate, but decided that instead of setting the bar too high, I should attempt a simpler design first. Turns out, these babies are easier to make than I'd imagined and lots of fun! 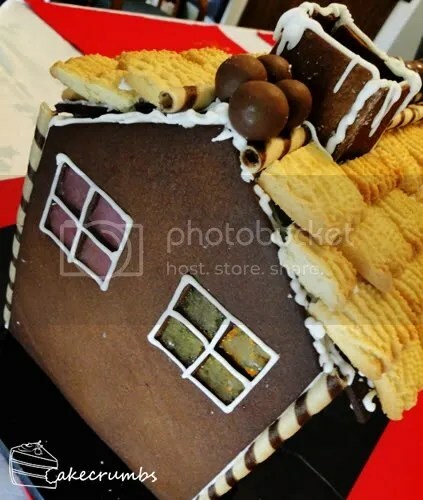 As I was making another gingerbread treat for the guests I made this one chocolate gingerbread to make it a little different. I gave the front section a heart-shaped owl hole inspired by this lovely barn owl conservation measure. 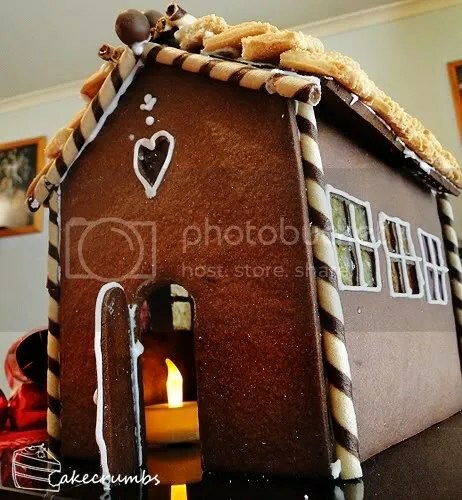 The roof was covered in shortbread and I used wafers and maltesers to decorate the rest of the roof. 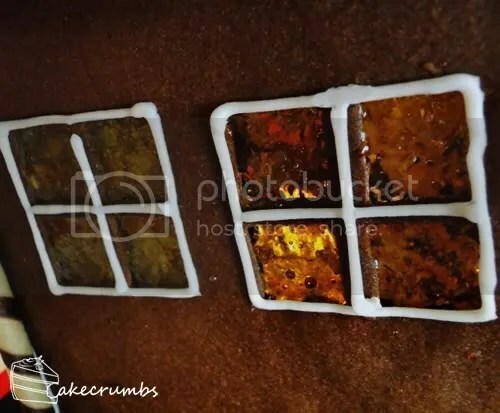 I used crushed lollies for the windows ala last years stained glass cookies. 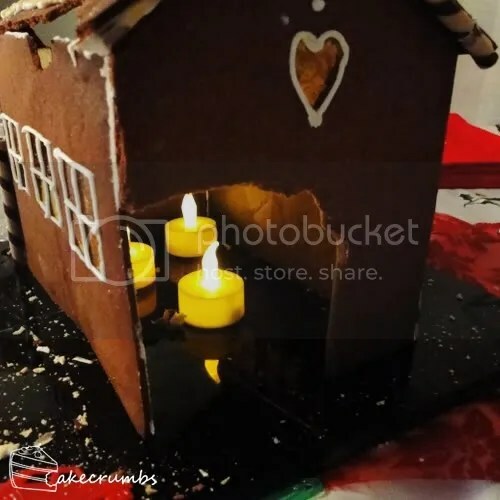 While I never decorated the inside as first planned, I still decided on including a really simple but effective technique to mimic a presence inside the house: tea light candles. The light flickered on the windows as though there was a fire burning inside. The photos really don't show this off well enough, so here's a quick video to show you what it looks like. After bon bons, my boyfriend decided it would be a good idea to adorn the house in the crappy toys from inside. Demolition time! The best part. 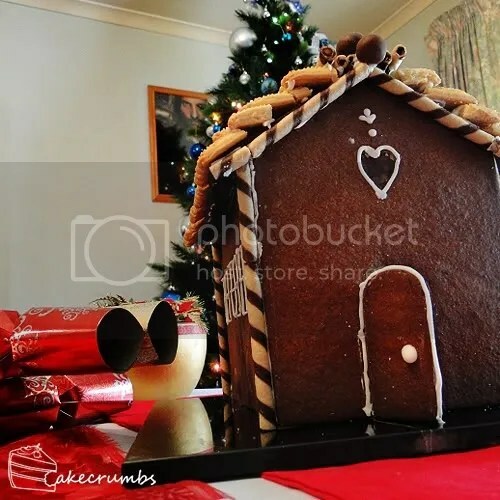 Desired chocolates, lollies and biscuits for decorating. NB: You will need a stencil of the house you plan to make cut out on baking paper. For mine, I cut roughly a 18x28cm rectangle for the walls, 18x18cm square for the front and back plus the triangle dome. The roof was roughly 12x30cm and the chimney pieces were about 5 cm. Cream butter, sugar and golden syrup until light and creamy; add egg yolks and combine. Stir in flour, cocoa and spices. Bring dough together and knead until smooth. Refrigerate for 30 minutes. Preheat oven to 180C (350F). Line 3 oven trays with baking paper. Divide dough into 6 portions. Roll a portions between two sheets of baking paper until 5mm thick. Cut out shapes for the house. Remember to cut out a door from the front panel and as many windows as you wish. I used a small square stencil to cut out 4 adjacent squared leaving a "frame" in between. I cut two windows in the back wall and three in the side walls. Bake large pieces for 15-20 minutes and smaller pieces for 8-10, until just golden (we want these slightly under done as they will be returned to the over later). Allow to cool completely before attempting to move or else your pieces may shatter. While waiting for gingerbread to cool, combine icing sugar, lemon juice and half the eggwhite in a bowl to make a firm paste. 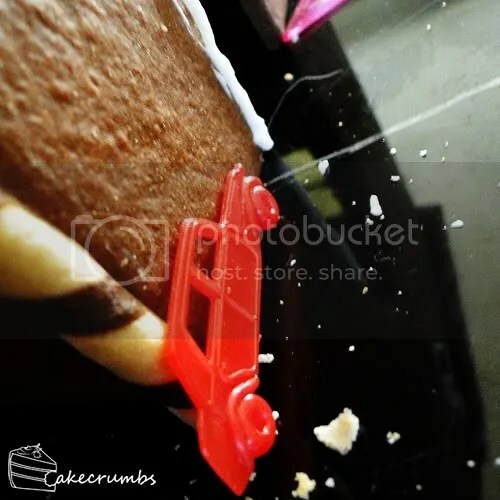 Place in piping bag fitted with 3.5mm diameter nozzle. 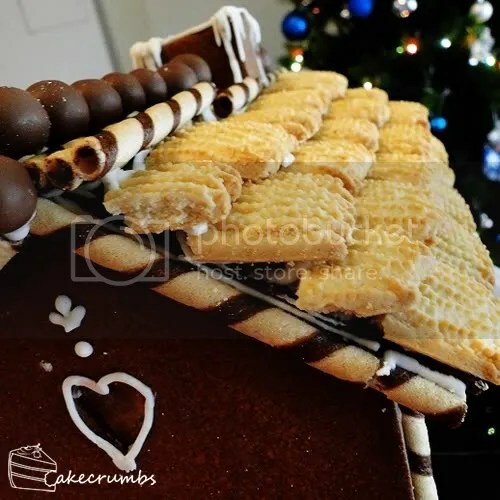 Decorate sides and roof of gingerbread whilst lying flat as this will help you get straighter lines. Pipe along base and side of walls and join. If required, you can use glasses to hold the walls upright while the royal icing dries. I found it bonded very quickly. Leave to dry overnight. Once again, I was very impressed, but never suprised. Excellent job. I’ve been enjoying eating and destroying it.